You can do the course practices using an original Arduino board. In fact, our PLCs have an original Arduino board assembled inside, So, it is not necessary to do practices using our devices if you don’t want. You can use an Arduino Leonardo board, which is the board used in our 20I/Os PLCs (they are called: Ardbox) and you also can use an Arduino Mega which is used inside the Ethernet family of PLCs (called M-duino). 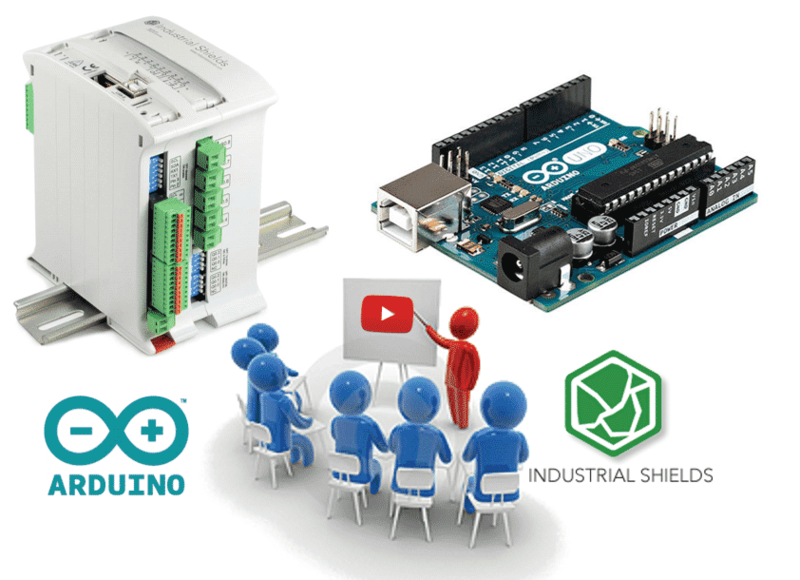 It is important to note that Arduino works at 5Vdc, then you can not connect industrial sensors directly on an Input on the Arduino board because industrial sensors usually work at 24Vdc. On the other hand, all Arduino based PLCs can be connected to an industrial sensor because all digital inputs can run from 5Vdc to 24Vdc. If you need to connect analog sensors, remember that the analog inputs from the Arduino boards work from 0 to 5Vdc. And you can not connect higher voltages. On the other hand in the industry, it is usually to use analog sensors which work at 4-20mA or 0-10Vdc. Then, convert the current signal to voltage is very easy if you use the Ohm formula: V=IxR, you can see an example of how to convert 4-20mA to 0-10Vdc at our blog.